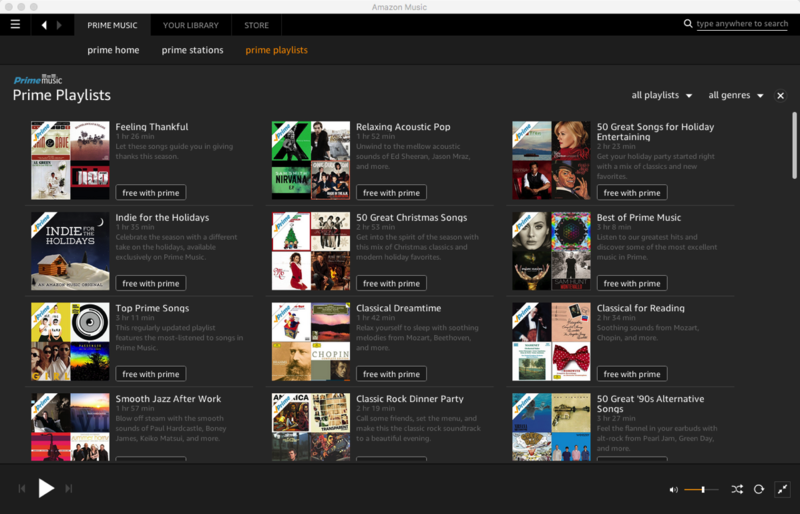 Today, I downloaded the Mac app for Amazon Music. To my dismay, logging in with my Prime credentials, the app did not recognize that I had a Prime membership. I suspect the problem is that I have an Amazon Canada Prime membership and not an Amazon US Prime membership. This is frustrating. It should really be global and unified. For people who travel lots and/or live in different countries in different times of the year, this is disappointing. Heck, even for Canadians staying put in Canada, this is frustrating. I’m living in Canada and have an Amazon Canada Prime membership. I downloaded the Amazon Music app, logged in, but it still doesn’t recognize me as a Prime Member. There’s no documentation explaining this for Canadian users. I also have a US Amazon.com account (same credentials exactly), and used to be a US Prime member when I’ve lived there too. Please advise. I’d like to invest more in Amazon and ditch Spotify, but not giving Canadian Prime customers the same benefits you give US Prime customers is frustrating and unfortunate. Honestly, I’d like to see you unify Prime to be a global membership. Let me also have the benefit of fast shipping when I’m in the US, UK or Canada with one single Mega Prime Membership. 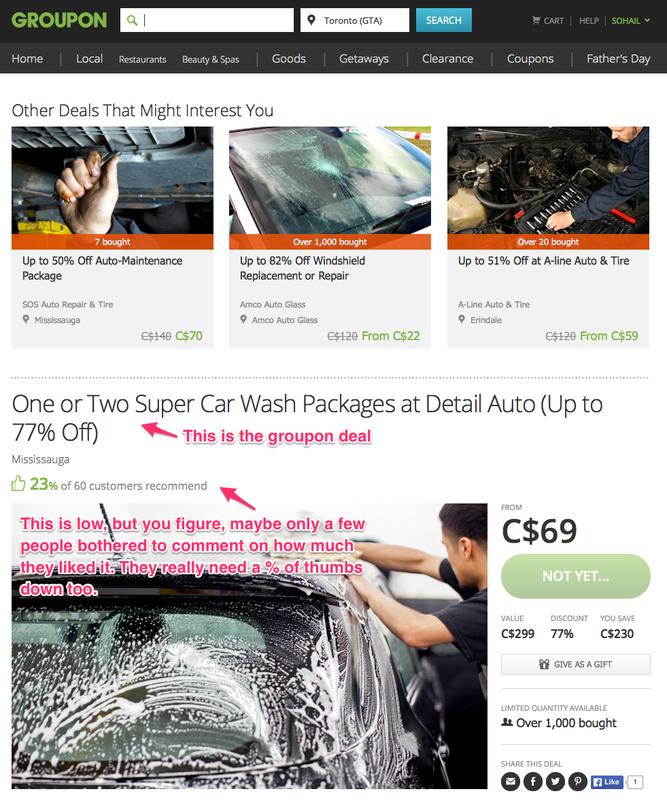 I recently needed to get some auto detailing done, and thought I’d rummage through LivingSocial.com and Groupon.com to find any auto-detailing deals in the area. I went with Groupon. What a mistake. They don’t seem to vet the vendors at all. Sure, there’s only 23% of who chimed in with a thumbs up, but perhaps most people just don’t bother giving feedback. After all, there are no thumbs down ratings visible here. Let’s look at the publicly visible testimonials for this deal. The three testimonials look really positive. You can’t glean anything negative about this vendor. Now that I’ve purchased, the page I can access for this deal gives me access to all reviews. Surprise surprise. These guys have a horrendous reputation. See below. Not a single positive review on the first page. The only good reviews are right at the beginning, and very short. Suspect. 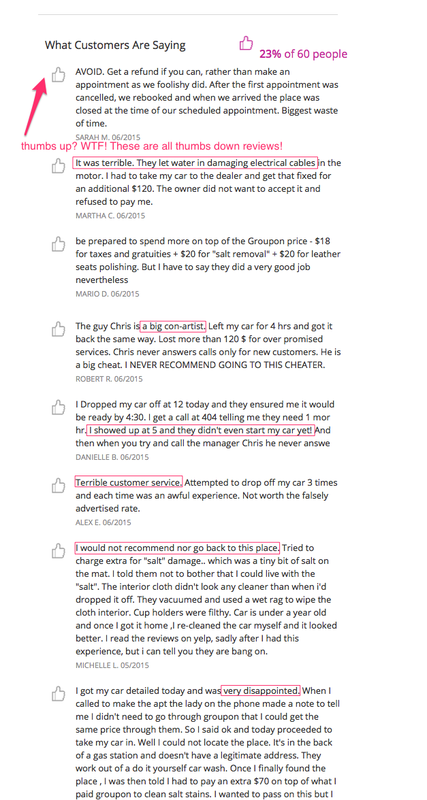 Why does Groupon have a thumbs up icon next to each of these reviews when they are all bad reviews? Since I purchased the deal about 5 days ago, I’m outside the window of requesting a refund. There’s no button on the Groupon website to do so. I can’t find a phone number to call. There’s no one I can email. I keep going in circles trying to find a support link that will let me contact someone with a human brain, instead of getting looped through “read this policy” and “read these fine print details”. Nothing. No way to reach a real human being and have a conversation. I’m not comfortable taking an expensive vehicle to a shoddy place with water damage reviews like this. Lesson learned: be weary using Groupon. I finally find a way to chat with a human agent by stating that I couldn’t get in touch with the vendor (which is true; I just tried calling and their voicemail box is full). 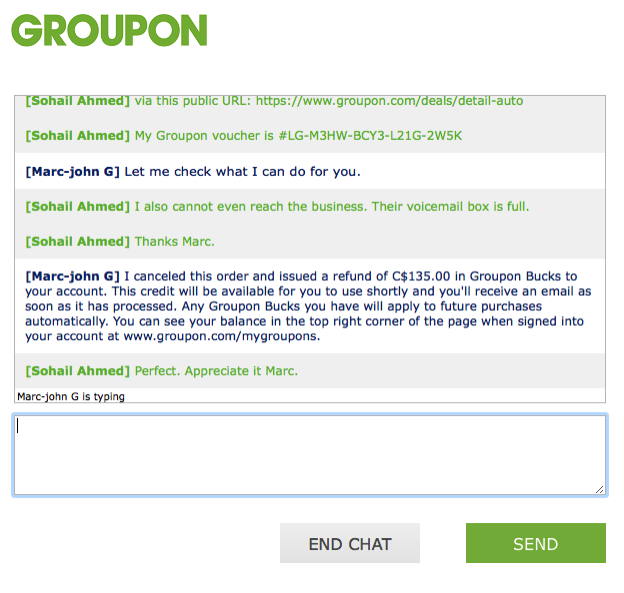 I’ve got a refund in ‘Groupon Bucks’, but I’ll be sure to use those in more established businesses, if I can even find such deals. Yesterday, I took an Uber. The weather was beautiful for a 25 min walk, but my friend and I needed to get to the theatre, and so I thought Uber would be faster. An UberX was “3 minutes” away. We ordered one up. The three minutes passed. Several more minutes passed. We kept waiting. It said the driver was still “3 minutes” away. We were running out of time to get to the theatre (a live performance; might not get seated if you’re late). To our dismay, the Uber app on my iPhone relayed, “Trip Cancelled”. Why would the driver cancel on me!? Immediately, I ordered another Uber. That one came and we got to our destination, just in the nick of time. Today, I woke up with a $5 cancellation charge in my email inbox, from Uber. Imagine my frustration. Insult to injury! To Uber’s credit, they reversed the charge and gave me a $10 credit. However, their policy response on Twitter has me scratching my head. Uber reserves the right to charge a cancellation fee to the customer when a driver cancels on the customer!? WTF!? Seriously? How dumb is that? 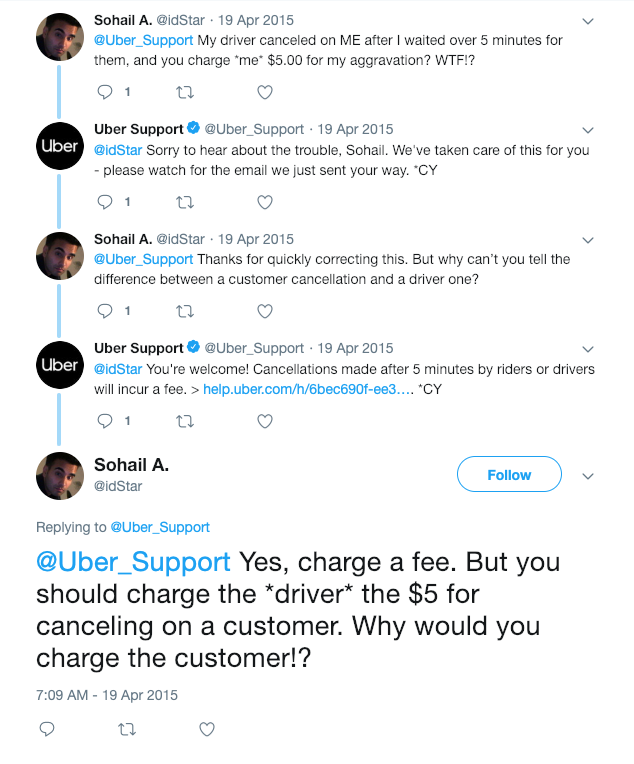 This is the policy cited by Uber Support in response to me asking why they couldn’t tell the difference between a driver cancellation and a customer cancellation. By directing me to that policy, they are effectively saying that “if you use our service, and don’t do anything wrong, we may charge you $5 and provide you with aggravation and no service”. It’s like ordering a pizza, waiting for 15 minutes as you think they are making it, and then having the pizza shop cancel your order, and charge you $5 because it was cancelled. Oh, and you don’t get a pizza. Here’s my conversation with Uber Support. Clearly, Uber has a really dumb policy on their hands, and/or support staff lacking common sense. I’ve used my Garmin 2820 a total of perhaps five times now, as living in the GTA usually doesn’t require it. The sound is clear and it even has an audio out jack for my auxiliary input jack of my stereo. So, if I’m *really* paranoid about missing audio cues when I’m driving, I don’t miss them now. Alternatively, if you pair it with a bluetooth headset, you should be able to get the same in ear (of course you could also use the audio out for regular headphones while driving, say one earbud in, if you wanted). The interface is very logical and anticipates what you want reasonably well. The navigation at a couple of weird spots in Toronto was a bit disappointing. Don’t know whether to attribute to less attention to the Canadian map data or just a sampling anomaly. For example, I punched in a Wynford drive address (cultural centre) and after it took me off the DVP, it didn’t tell me to turn onto a crucial cross street (was highly unintuitive at night) to actually get to the entrance of the destination. I’m used to these things generally routing you right to the front door. Conversely, going to a friends new condo in Downsview, everything was perfect and I got right to the front entrance. The thing with the 2820 is that like with most of these portable units, I don’t leave it on the dash ready to use, b/c it’s of course, more of a theft target, alarm notwithstanding. So I wrap it up in a little sports bag and whip it out when I need nav help. It’s too big for the glove box (unless you have a really big glove box with nothing else in it). Often, I’ll leave the GPS in the trunk so there’s less for wandering eyes to wonder about. I really wish I had a unit built into the vehicle I didn’t have to fold away, unplug etc. Really, these units are best for travelers. In one’s main car, I’d recommend going to the mobile audio/nav specialty shop and installing something. While my 2820 has a bigger display than the Garmin ones with the “c” prefix (the smaller square shaped ones), I noticed that the extra screen space is mostly used for extra stats like distance to destination, ETA, current speed etc. In hindsight, the smaller “c” models that you can shove in your glovebox with effectively the same map display area, are probably better. That is – if it’s going to be portable than make it fit in your glove box – otherwise – go with a properly installed permanent device. Having used the device, I realized my concerns about a slightly larger screen size than the “c” models provide, was unfounded. Perhaps there’s a mode I can set mine to to take up the full screen, sans the stats. It would be of negligible impact however. The audio cues and a quick glance over seem to really be all that one needs – even with a smaller model. My 2820 is definitely a solid piece of technology and it does the job. It’ll always get me in the area, if not to the doorstep of where I need to go. I’ve not used the “places of interest” and other such look ups, but my brother in law and cousin have the smaller Garmin units that do this as well, and they’ve been happy with those functions. With respect to your friend’s X5, if he can get one mounted and retrofit into his existing audio setup, that’s the best bet. I’m guessing it’s too late for that without redoing a lot. So, the next option is the 2820, if one is willing to leave it out on the dash all the time (perhaps windows sufficiently tinted or the alarm sufficiently ominous). If it’s going to get pulled out only when needed, I think the “c” units that can go in the glove box are both workable and most practical. Sometimes, laying ethernet cable everywhere you need to in the home isn’t very practical or easy. Sure, you’ll get the 100 Mbps or even 1 Gbps (depending on the equipment you have), but some physical structures and distances make it prohibitive. Enter WiFi, right? Well, sort of. Sometimes. The signal can be choppy in homes and it’s hit and miss. Some computers, after losing a WiFi (802.11 a/b/g) signal never gracefully reconnect themselves. This is a pain. Enter Ethernet networking over powerlines. Yes, that’s right. Over your electrical wiring in the home. While hydro (power) companies are finalizing technology to be your broadband provider the way cable companies already are, devices are already on the market that allow you to use your home or apartment’s own electrical wiring to extend your home network. Have an electrical socket in a room? Then you have Ethernet. I just bought the Netgear XE104 device (you need at least two). Mine cost me just over $100 CDN. See http://www.netgear.com/products/details/XE104.php. While advertised at up to 85 Mbps, depending on the quality of your internal wiring, distance etc., many people have commented that they don’t get even 25% of that speed. However, I’ve tested in a 20 year old condo, and am getting a steady 58 Mbps. I am impressed. I am pleased. I would highly recommend this product to anyone who needs a moderately fast local network extension in their home that won’t flake on and off like 802.11x. I’ve been pretty impressed with Pandora.com. It’s an Internet radio player that plays in your browser and fine tunes what it serves up based on your training it with a thumbs up or thumbs down. You can set up several “radio stations” reflecting different styles. See CNET.com / NYTimes.com article by David Pogue discussing the Squeezebox 3 from Slim Devices. A few years ago, I read David Allen’s “Getting Things Done” and have recently been asked about its effectiveness. Before I discuss that, let me step back and summarize my view on the genre of task/project/goal/life planning tools, books and systems. No one system is going to suit everyone. Each individual will have some areas of valid resistance in adopting 100% of the suggestions of any system. That being said, some systems are generally more effective than others. Ultimately, those whom you see around you as very effective, organized, on-the-ball, etc., have created their own systems by fusing best practices from one or more good systems, coupled with their own intuition about what works. Often, the best systems are those that we look at and think, “This is all common sense!”. I believe that having common sense codified, streamlined and packaged as a system has lots of value. It forces you to consistently align thinking, behaviours and action with a belief that you are following a system that actually works. When you believe in something, it often comes to fruition. Now, as far as David Allen’s “Getting Things Done” is concerned, the book is an easy read and recommended. One of the most valuable principles here is that you must, must get things out of your head and on paper (or a computer or an organizer or…you get the idea). Just getting them out of your head frees your subconscious from having to act as an intermittent alarm clock about things you need to do and places you need to be. This releases a tremendous amount of energy and mental clarity. Now of course, this only works if your brain trusts that where you’ve recorded stuff is really a safe and reliable system – otherwise your subconscious will again attempt to be that record keeping system – having lost faith in a feeble attempt to relieve it of this duty. Most of GTD is geared toward building a reliable set of trustworthy and effective systems for dealing with the inflow of tasks, commitments, projects, etc. David Allen has a website and you can find his book on Amazon. If you’re interested, you should check out his website which has a five minute video on it introducing the man, some industry endorsements and so forth. You’ll also get a sense of his style. A lot of what David Allen has to say is about building reliable, effective systems for capturing incoming events (calls, mail, to-do’s, appointments etc.) as well as re-organizing what you already have as baggage into this new system. Another key concept of GTD is the “next action”. This simply put, is you identifying in your hierarchical list of projects and tasks, what the next action is for each little project that you have. You can also organize things by how much energy they take (for example, calls you need to make). If you have your list with you – say you’re waiting in line somewhere, you can pull out your calls list and start making some calls on your cell phone. By having things organized and at your finger tips, you can take advantage of different types of time windows that become available to you. If you’re looking to get organized or to compliment your current system, I highly recommend the book. I believe that for most people about 80%+ of it will be relevant and at least 30% of it will be things you hadn’t thought of, but which you’ll find yourself immediately agreeing with. I’ve tried the major desktop search tools (Google, Yahoo! and Copernic) and I must say, Copernic is far superior to the rest. For those of you not familiar with it, desktop search tools are a new breed of tools trying to do for your own hard drive what search engines have done for the Internet for years: help you find stuff quickly. These days, everyone has large hard drives with their data all over the place. You need a search engine to find your own stuff! Spending time to organize your computer contents mitigates this need, but even then, it’s nice to have a snappy tool to assist you in the search process. These tools search not only files on your hard drive, but also search all of your email, often inside attachments too. Google gives you results in a web browser, similar to their Web Search that everyone is familiar with. However, Yahoo! and Copernic give you a more powerful rich client interface (application) that helps you segment and preview items much more easily. The Yahoo! Desktop tool is currently in Beta and it felt like it. The indexing must have been messed up on my version – simple things in emails that it could find when I installed it – it could no longer find on subsequent attempts. 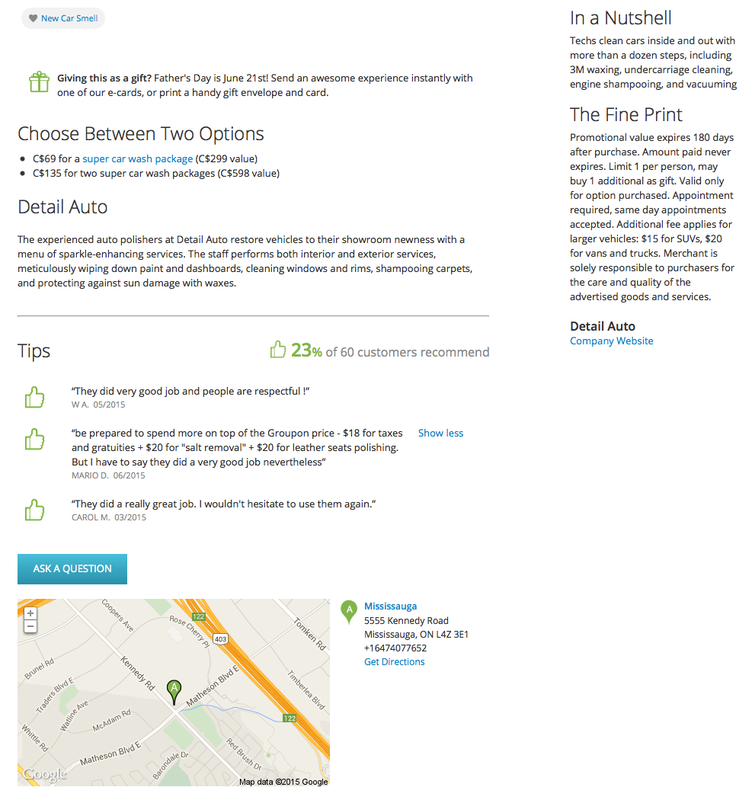 So I resorted to Copernic (I’ve used their general Internet Search Agent before) and I was very impressed. It worked. Flawlessly. I could preview items in one pane and get date sorted results in another – similar to Outlook 2003’s segmentation of folder contents. Copernic has been a joy to use and it is quick. Copernic is highly recommended (and not just cause it’s from a Canadian company!). For those of you on Skype, I’ve noticed that when you install on different computers, one’s list of registered contacts doesn’t move to the new computer the way mainstream IM clients like MSN, Yahoo! and AOL do. This is a minor inconvenience and I imagine at some point in the future, Skype will remedy this. 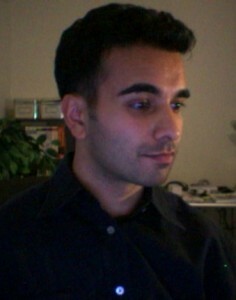 On a related note, Skype tends to have a minor upgrade available every couple of months. I tend to install these as soon as they come out, if for no other reason, so that it’ll stop nagging me! I’ve just upgraded to the latest and am happy with it; everything still works great. And of course, you won’t lose your contacts when upgrading on the same computer as you currently have it installed at. I really like my Maxtor “One Touch” backup drive. I got the 300 MB version (has both Firewire and USB 1.1/2.0 interfaces). I use the Firewire interface and connect it to my server. It was about $330 at CompUSA. Note that the “one touch” button just launches any program you’d like, including backup software. Since I schedule a nightly incremental backup of data, it really isn’t necessary for me. If you had one of these one-touch drives attached to each of your computers, then I can see value in configuring it to do an incremental capture of the local system and data on demand. There’s a flash demo available as well. I use this for data file backups from shared (and secure) data folders across the home network. The Dantz Retrospect Express Software is very good. It takes a little getting used to, but then it works reliably. For image backups, I recommend a copy of Norton Ghost 2003 for each machine to be backed up. Configure it so the image gets dropped to a file share on your server (the Maxtor drive, in fact), and everything is centralized for backups.